In the wake of the Apple v. Samsung cases, the importance of design patents has become more visible. Whether a product infringes a design patent can sometimes be difficult to determine because design patents only protect the ornamental aspects of a design, and not the functional aspects. The Federal Circuit, in Sport Dimension, Inc. v. The Coleman Company, Inc. (No. 2015-1553) recently considered the interplay between ornamentation and functionality in a design patent. Coleman sells a variety of outdoor sporting equipment, including personal flotation devices. 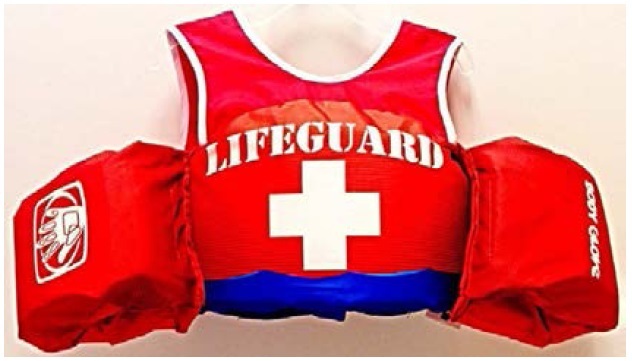 One of its products, a flotation device with two arm bands and a torso piece, is protected by US Design Patent No. D623,714. Sport Dimension also sells personal flotation devices, including its line of Body Glove products that also have two armbands and a torso section. Coleman brought suit against Sport Dimension, alleging infringement of the ‘714 patent. The trial court adopted Sport Dimension’s claim construction, which expressly excluded the arm bands and side torso tapering as elements of the claim, because functional elements not protected by the patent. Coleman then moved for entry of a judgment of non-infringement in favor of Sport Dimension so that it could appeal the claim construction ruling. The Federal Circuit reversed the claim construction, vacated the judgment of non-infringement, and remanded. The Federal Circuit began by noting that it is often difficult to use words to describe a design, which is why illustrations are an important part of design patents. Despite the limitations of words, the Court noted that it is often constructive for courts to construe design patents in order to guide the fact finder in determining infringement. The Court then noted the law of infringement of design patents–a design patent cannot protect purely functional designs, but it can protect designs that are not primarily functional even if certain elements have functional purposes. Thus, design patents can be used with products that have elements that are both functional and non-functional, but the design patent will only protect the non-functional elements that are shown in the patent. Of particular interest to design patent litigators, the Court reviewed the key cases in the design patent arena. In analyzing the patent in dispute and the trial court’s claim construction, the Federal Circuit found that the trial court went too far in excluding entirely the arm bands and tapered side torso from the scope of the patent. The Court agreed that these elements had functional aspects, but concluded it was improper to entirely exclude these elements. The test for infringement of a design patent is not an element-by-element comparison. Instead, infringement is to be assessed based on the overall design, excluding the functional aspects of certain elements (as opposed to excluding the elements entirely). Based on this faulty claim construction, the Federal Circuit vacated and remanded. This case highlights the difficulty that design patents present for courts and fact finders. Sometimes, the functional/ornamental aspects are difficult to distinguish and apply. Nonetheless, design patents are still an important piece of intellectual property for many companies and should not be discounted lightly. The Federal Circuit issued an interesting opinion today in Pacific Coast Marine Windshields Ltd. v. Malibu Boats, LLC (Case No. 2013-1199) and authored by Judge Dyk, holding for the first time that prosecution history estoppel applies to design patents and that a patentee can surrender subject matter during prosecution through its actions. The owner and CEO of Pacific Coast filed a design patent application in which he submitted drawings showing five “patentably distinct groups of designs” and claimed an “ornamental design of a marine windshield with a frame, a tapered corner post with vent holes and without said vent holes, and with a hatch andwithout said hatch, as shown and described.” The examiner issued a restriction requirement and required the applicant to elect a single group (and file additional applications for the remaining groups, if desired). In response, the applicant chose the first designated group and amended the claim to remove the vent hole and hatch language: “the ornamental design of a marine windshield with a frame, and a pair of tapered corner posts.” He also cancelled figures 7-12, leaving just the embodiment with four circular holes on the corner post and a hatch on the front of the windshield. The remaining figures (1-6) showed alternated views of the four-hole embodiment. The amended application ultimately issued as a design patent. Pacific Coast filed suit against Malibu Boats for making and selling windshields with three trapezoidal holes on the corner posts (shown above). Malibu Boats moved for summary judgment of non-infringement, arguing that Pacific Coast surrendered the non-four-hole embodiments on the grounds of prosecution history estoppel. The District Court agreed, and entered summary judgment in favor of Malibu Boats. Pacific Coast appealed. The Court first noted that while prosecution history estoppel is more often raised in the context of utility patents, the doctrine nonetheless applies to design patents. Surprisingly, this was an issue of first impression for the Court (although recognized in treatises and by district courts previously). The Court did note that the context is somewhat different, however. For utility patents, infringement can occur either literally or under the doctrine of equivalents. Design patents are different and do not require literal identity to impose liability. Instead, liability arises if someone applies the patented design or any colorable imitation of it (in other words, sufficient similarity is sufficient). Thus, literal infringement and equivalents infringement are intertwined from the start. The Court determined that doctrine of prosecution history estoppel should apply to design patent prosecution in order to preserve the public notice function of the process. A patentee should not be able to recapture subject matter that it abandoned during prosecution. To determine whether prosecution history estoppel applies, the court must consider (1) whether there was a surrender of material, (2) whether it was for reasons of patentability, and (3) whether the accused design is within the scope of the surrender. For design patents, the drawings define the scope of the invention, not the claims. Therefore, the court must look to what materials in the drawings the applicant surrendered. Here, the applicant removed drawings with two holes and no holes in the corner post. This constituted surrender of these designs and limited the design to a windshield with four holes in the corner post. The Court next determined that the material was not surrendered for reasons of patentability—e.g., anticipation, obviousness, etc.—but it was surrendered in order to secure the patent. Pacific Coast argued that the doctrine of prosecution history estoppel only applies to surrenders to avoid the prior art, but the Court disagreed, finding the doctrine was broader than that. Any narrowing amendment made to satisfy any requirement of the Patent Act that narrows the scope of the patent qualifies. The Court concluded that amendments to satisfy a restriction requirement for design patents qualify. Notably, the Court specifically stated that it was expressing no opinion on whether this same analysis would apply to utility patents. Finally, the Court considered whether the accused design was within the scope of the surrender. Malibu Boats argued that everything but a four-hole design was surrendered, but the Court wasn’t so sure. The patentee clearly surrendered a two-hole design and obtained coverage for a four-hole design, but did not seek coverage or surrender a three-hole design. Malibu Boats did not argue that a three-hole design was not colorably different from a two-hole design. Therefore, the Court concluded that no prosecution history estoppel arose because the surrendered material was different from the accused device (two-hole versus three-hole). The Court noted that under these procedural circumstances that it did not have to engage in an analysis of whether the scope of the surrender was to be measured by a colorable imitation standard. This case presents an interesting new decision in the design patent field. Design patentees need to be careful when faced with restriction requirements, and should seriously consider filing divisional applications to avoid potential problems like these. The case also highlights the dangers of sailing in uncharted legal waters, where the Court may hold the lack of an argument against you when it may not have been clear that you needed to make it in the first place.